My inaugural blog. How scary. I teach other people how to write for blogs, find content for blogs and use WordPress. I subscribe to several blogs I read religiously. And yet, I’ve never blogged. It’s not the medium that held me back but the fear I had nothing to say or share. So… we’ll see. I guess even if only my mother reads it I’ve still made at least one person smile. It’s April 22 and it’s 40 degrees out. My daffodils and hyacinth are blooming and the forsythia have huge buds ready to open even on this cold, rainy, gray day. So I’m planning for warmer days. My American Horticulture Society Gardening Manual is open to the pages on flowering shrubs. My last two issues of Garden Gate and Fine Gardening have key pages folded with notes. I have post-it notes with comments on more than a dozen pages of The Flower Factory (Stoughton, WI) catalog. It’s like planning for summer to come. I know I should wait, but the lure is often too much. 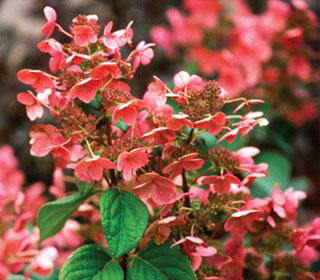 So I may just give in to temptation and buy the Quick Fire panicle hydrangea from Avant Gardens. It blooms in white turning to rich pink and it blooms early and long. Best of all? It is hardy in zone 4!